There are many schools to chose from for a child with ASD (Autism Spectrum Disorder) or any other form of Learning Disability. 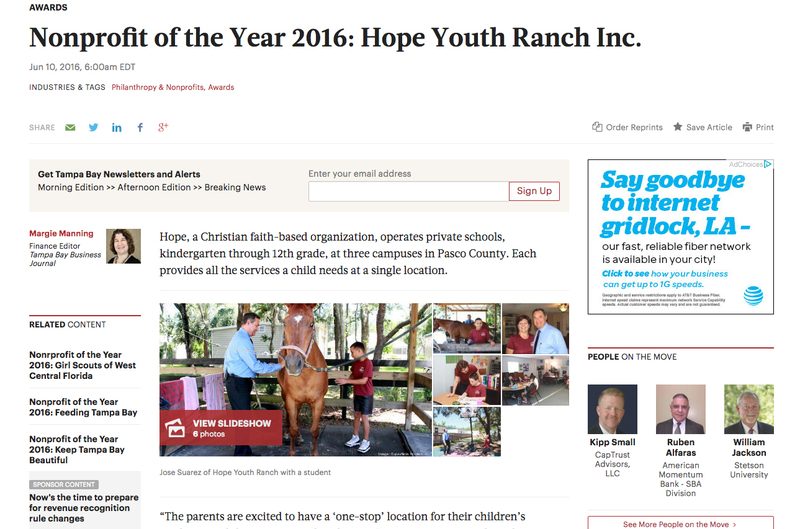 So what makes HOPE Ranch Learning Academy the BEST choice? The use of animal assisted therapy has been proven to have benefits beyond traditional education methods. By employing animal assisted therapeutic activities in the education curriculum of the child, as part of the school week, healing and learning happens exponentially as a result of this interaction. We employ horses and dogs in our educational process to reap the maximum benefits possible. The strategies of the Teaching Family Model can be used by anyone in any setting and is a child-centered, humane, objective, and effective way to teach life skills to our students. The Teaching Family Model was established in the late 1960's by a collaborative effort between the University of Kansas and the National Institute of Mental Health. This model was recently recognized by the American Psychological Association as an effective method for improving behavior because it is Empirically Tested and Evidence Based. HOPE Ranch Learning Academy is one of a handful of schools in the nation that incorporates the Teaching Family Model strategies in our teaching approach as a way of teaching social skills to our students as part of the curriculum. By teaching the students how to master key social skills, they learn how to effectively deal with various environments and therefore become successful life learners. Founded by educators nearly 40 years ago, the Northwest Evaluation Association produces an education assessment called MAP (Measures of Academic Progress) which is used by over 7,400 school districts to accurately measure student growth and learning needs from Kindergarten to 12th grade. Using the MAP process, our teachers know exactly how to better tailor their lesson plans and teaching instruction to better help our students succeed. Due to our excellence in education, HOPE is one of only 40 private schools in Florida invited to be part of this process. As many of our students reach High School the parent's concern turns more heavily to life readiness skills for their children. HOPE For Tomorrow is our Transition Program to Independence where High School students are exposed to practical life skills, job training, cooking, basic financial management, and many other practical life skills. Coupled with our Transitional Living Lab, our students learn about living independently while completing their academic requirement for graduation (which can be extended to age 21). Through a dual enrollment agreement HOPE has with Pasco State College, some students even take dual enrollment classes. As every academic year progresses, every student at HOPE receives an individualized success learning plan. This plan is data driven and is developed with the parents, teaching staff, students (if age appropriate), and the rest of their support team. The Plan is a living document reviewed several times through the school year to ensure on track performance to meet the agreed on goals. The Plan sets the expectation for what we all, as a team, expect to accomplish by the end of the school year related to the student's success. HOPE Ranch Learning Academy (HRLA) uses a variety of educational curriculum designed for students with learning disabilities. Our educational philosophy is "student focused" rather than "teacher focused". Our students receive individualized instruction through the utilization of all learning modalities (visual, auditory, and tactical). Also, by testing academic competency at the beginning and the end of every academic year, we can quantify the actual progress. There is no doubt that the cost of education for learning disabled students is much higher than those of non-learning disabled students. Ask any parent of an ASD child and they can easily understand this. HOPE Ranch Learning Academy has designed its systems and services to minimize the parent out-of-pocket cost without compromising educational or service quality. We do this by keeping our operating costs low, networking effectively with community heroes to provide some of our needs, and work with volunteers (which we fully train and background clear) to provide the most support to our students and staff. Additionally, we are certified to receive various school scholarship programs from the Florida Department of Education (Step Up For Student needs scholarship, Personal Learning Student Account, McKay). We also partner with national lending providers in case parents need an extra financial support. Integrity is doing what is right, regardless of who's watching or personal cost. We believe personal and business integrity are directly linked to the individual's character and the corporate character (or culture) established and promoted by its leadership. HRLA expects uncompromising high level of integrity in all that we do and strive to become.